StageofLife.com releases its national survey report about "Teens and Music." It shares statistics about teens' music purchasing behavior, trends on how teens feel about music in relation to their parents, and nearly 200 personal essays submitted by teens about their favorite, inspirational songs from national recording artists. We had an incredible outpouring of heart-felt essays submitted as teens shared their personal stories tied to inspirational songs from national recording artists. Music plays an emotional role in the lives of teenagers. There are the songs playing in the background on the radio during a first kiss, or the songs hanging in the air during the those memorable, sometimes awkward, high school slow dances. Then there are the songs that help teens through a difficult time. However, as important as music is, many students are no longer paying for it. StageofLife.com, an educational, digital literacy initiative for teens, teachers, and bloggers, reports in its most recent national survey that nearly half (49.2%) of teenagers do not spend money on purchasing music - instead choosing to copy music files friends, download songs from free music websites, or listen to free web-based music services like Pandora Internet Radio. --34% of teens like the music their parents listen to, and 83% claim that their parents like all or some of their music. --10% of teens state their parents have no clue about what type of music they listen to or is downloaded on their music devices. --Nearly 1 in 2 teens (49.2%) spend $0 (zero) per month on music; 38.7% of teens buy 1 album a month (spending $10-$15); and 2% of teens spend more than $50 per month on music. --41% of teens bought a CD or paid to download a song or album without having first heard the music simply because of a good review or it was recommended to them. --35% of teens rank "Friends" as the #1 source to find out about new bands or music. Also ranked high as sources for new music are internet/blogs (22.3%) and the radio (19.4%). The music survey results stemmed from StageofLife.com's monthly, national teen writing contest. This particular writing prompt asked students to share a specific story about a song that was inspiring to them at an important point in their life. Over 9,000 teenagers visited Stage of Life's writing contest page, 425+ participated in the music survey, and nearly 200 students submitted a qualifying 500 word essay to nominate a song important to them. StageofLife.com founder, Eric Thiegs, stated, "We had an incredible outpouring of heart-felt essays submitted for this writing prompt as teens shared their personal stories tied to inspirational songs from national recording artists" such as Phil Collins, Cold Play, Mumford and Sons, Jason Mraz, Taylor Swift, Eminem, Jack's Mannequin, Trading Yesterday, Connie Francis and scores more. The winning student essay discussed how the song, “I Wonder” by Kellie Pickler, made the writer think about the mother she never had. StageofLife.com's current national writing contest addresses the topic of “Politics and Passion” as it asks students to share a personal essay about the one political issue that is the most important to them in the upcoming U.S. Presidential election. Teens and college students interested in having their political voices heard can submit their essay and enter the national writing contest by visiting StageofLife.com. Essays are due by midnight (Pacific Time) on September 30th. 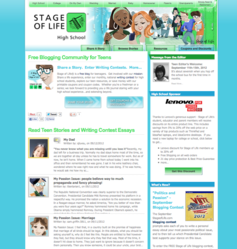 StageofLife.com is a free blogging community with a digital literacy mission to encourage the development of life-long readers and writers. It features monthly writing contests, free educational resources, financial literacy tools and more.